Lets talk extensions. My name is Amy, and I am our lead extension Specialist at Virtue. I want to start by telling you why I love doing extensions. First, I am really passionate about healthy hair; so when we discovered micro-bead extensions I was thrilled to have an option that allowed for an amazing transformation without damage. Giving people their dream length, or dream volume without affecting the integrity of the hair is hands down my favorite part. Seriously, I may or may not be crying while typing this. Educating people about making their dream hair a reality with extensions is truly amazing. Many individuals have a lot of questions, and I have a lot of answers. We use Dream Catchers Hair Micro Bead Extensions. This means that there is no heat, no glue, and no tape. They are fastened to the hair with a really small (micro) bead. To remove the bead, we simply loosen the bead and slide it off! Check out our photos below for a visual. As long as they are taken care of and properly maintained, then absolutely not. Some things that can cause damage include: not scheduling routine maintenance, sulfates in shampoo, and pulling the hair back into a tight ponytail or bun. Anyone and everyone! These extensions are customized for each guest. Depending upon each individual’s goal, extensions can achieve volume, or both length and volume. These extensions are for people who want them more long-term. 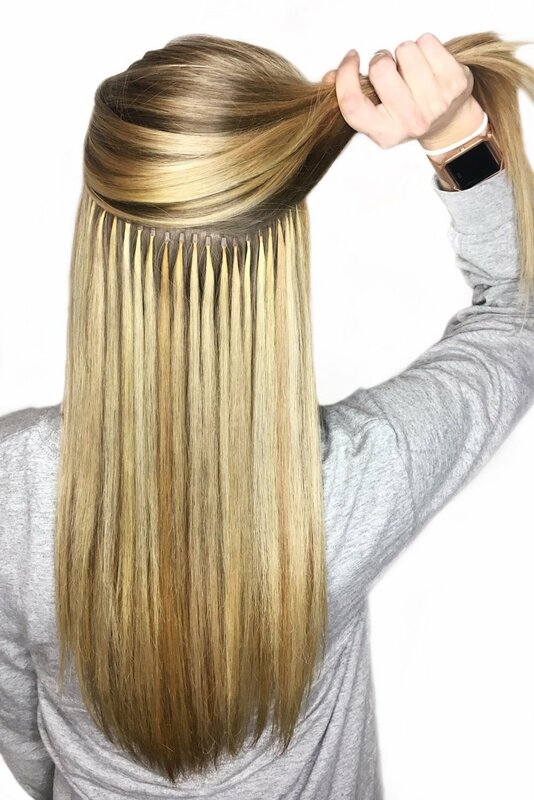 Clip-in extensions would be recommended over Dream Catchers for a more short-term or one-time event option. Is the Dream Catchers hair real? Yes Dream Catchers Hair uses the highest quality of 100% natural hair that comes from a single donor, which guarantees uniformity in texture. Also, the hair cuticles are intact which allows the hair to maintain health longer. It can be washed, colored, heat styled, and treated like your own hair. What does the maintenance look like for these extensions? These extensions must be maintained every 4-6 weeks. These appointments range in time from a half hour to two hours depending on the maintenance one is due for. Will my hair be harder to style with extensions? Styling hair with extensions will not be more difficult. However, since the amount of hair will increase, styling will take an increased amount time. Can I still have my hair colored with extensions? Yes. There is a two-inch space between the hairline and the extensions so color retouches can be applied as usual. Also, color can be applied during extension maintenance! I am so excited to share some information about extensions with you all! We are currently running a special through the whole month of March on extensions. We have three specialists at Virtue, Cayla, Shayla, and myself. Extensions consultations with one of our specialists are complimentary. Set up a consultation to see if extensions would be the perfect fit for you.